Due to the high cost of drug discovery/development and the low likelihood of potential new therapies successfully making it through the drug development pipeline, there is great interest in the development of assays that will better inform upon clinical trial results. Some of the methods that are being explored are moving away from 2D cell-based assays to 3D cell-based assays and to assays with multiple cell types (co-culture) to try to mimic the in vivo tumor microenvironment better. Additionally, we are learning more and more about the heterogeneity between patients that ostensibly have the same disease, leading to an interest to test a given therapy in many different contexts to see whether it will be applicable broadly or only for a subset of patients with the same disease. When drugs are only effective for a subpopulation, this drug is still of interest, particularly if the patients can be stratified prior to treatment based on a biomarker. 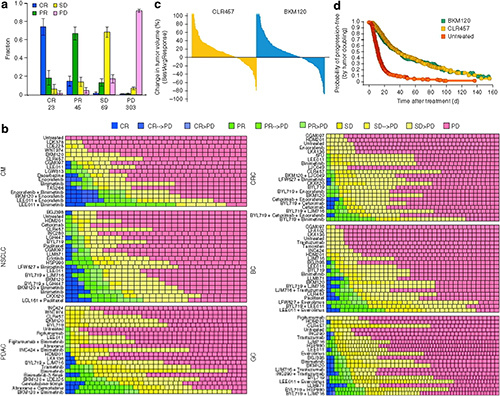 The authors used ∼1,000 patient-derived tumor xenografts (PDXs) that covered a diverse set of driver mutations to test 62 different treatments (36 single agents and 26 combinations) spanning six indications. Each of the PDX models had been evaluated for copy-number, mutation status, and mRNA expression. One of the challenges of running PDX models early can be the cost due to multiple animals per cohort. PDXs also are run in animals without an intact immune system. Here, the authors used a one animal per one model per one treatment (1 × 1 × 1) method, which limits the number of animal per cohort. Their population-based approach can be seen in the figure, where the definitions of CR, PR, PD, and SD are modified from the RECIST criteria. They note that only 10% of individual responses differed from the majority response by more than one RECIST category, indicating that by and large, a single animal did adequately represent the drug response. Additionally, the two pan-PI3K inhibitors had very similar response rates. They compared the concordance between the clinical samples and PDX models and CCLE models, and found the greatest correspondence between the PDX models and clinical samples. They highlight several mutations that are found in patients but are not captured or underrepresented in PDXs and cell lines (MDM4 and PHGDH), and note that it is not known whether their under-representation is due to a selection bias in their ability to grow in a dish or as a PDX. The mutation frequency in the PDXs used here correlated well with the patient tumors. Some key examples where the in vitro assay result and the PDX trial yielded different results were the combination of CDK4/6 with other targeted therapies and the combination of IGF1R with other targeted therapies. The authors mention that clinical trials for the IGF1R combinations are not that promising to date, which agrees with the PDX results but is in contrast to the promising in vitro results. Another interesting outcome was that the continued treatment with the Raf inhibitor encorafenib alone or combination led to resistance by BRAF amplification, a mechanism of resistance observed in the clinic. Having more tools in our toolbox to try to determine likely clinical trial success and the ability to obtain early indicators of resistance pathways are important, and this paper highlights an approach that may help provide a high-throughput way that uses fewer animals per data point to allow broader profiling of tumor heterogeneity. Systematic approach for in vivo compound profiling using PDXs (PCT), and its reproducibility. (a) Feasibility assessment of 1×1×1 PCT approach by Pearson correlation analysis. x axis, number of majority response from each response category; y axis, fraction of individual animal response relative to the majority (average±s.e.m.). A total of 2,138 single-animal response data were collected and categorized from 440 unique treatment models (Online Methods). CR: complete response; PR: partial response; SD: stable disease; PD: progressive disease. (b) Summary of compound sensitivity in the PCTs. The BestAvgResponse was used to make response calls (Online Methods), and each square represents a PDX. A total of 62 treatment groups were tested in 277 PDXs across six indications (BRCA (breast cancer, n=43), CM (cutaneous melanoma, n=33), CRC (colorectal carcinoma, n=59), GC (gastric cancer, n=64), NSCLC (non-small cell lung carcinoma, n=36) and PDAC (pancreatic ductal adenocarcinoma, n=42)). 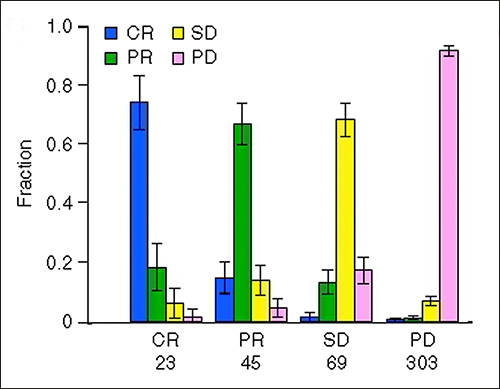 Arrow (CR → PD, PR → PD, SD → PD, and CR>PD, PR>PD, SD>PD) indicates disease progression; >p indicates progression seen after 64 d; >p indicates progression in <64 d. (c) Waterfall plot of responses to the PI3K inhibitors CLR457 (n=205) and BKM120 (n=213) across all indications; each bar represents an individual PDX. (d) Kaplan–Meier progression-free survival curve of PDXs treated with CLR457 (n=205) and BKM120 (n=213) across all indications. For a larger image click here. Profiling candidate therapeutics with limited cancer models during preclinical development hinders predictions of clinical efficacy and identifying factors that underlie heterogeneous patient responses for patient-selection strategies. We established ∼1,000 patient-derived tumor xenograft models (PDXs) with a diverse set of driver mutations. With these PDXs, we performed in vivo compound screens using a 1 × 1 × 1 experimental design (PDX clinical trial or PCT) to assess the population responses to 62 treatments across six indications. We demonstrate both the reproducibility and the clinical translatability of this approach by identifying associations between a genotype and drug response, and established mechanisms of resistance. In addition, our results suggest that PCTs may represent a more accurate approach than cell line models for assessing the clinical potential of some therapeutic modalities. We therefore propose that this experimental paradigm could potentially improve preclinical evaluation of treatment modalities and enhance our ability to predict clinical trial responses.